In addition to skiing and snowboarding, many fun activities for all ages await you in Tremblant during the school break. From Monday to Friday, 3:30 to 4:30 p.m. come play outside with us. Street hockey, volleyball and many other activities are planned! Between 7:30 and 9:00 p.m., the open-air discotheque will have the whole family boogying down! Come meet our beloved mascot, Toufou! Daily from noon to 4:00 p.m. in the pedestrian village. Get a family photo taken and even get his autograph! 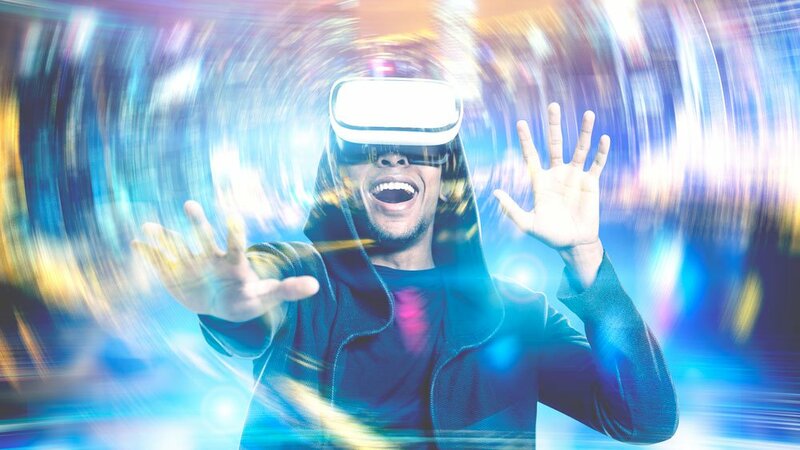 Come try thrilling, immersive virtual reality rides, comfortably seated in your full-motion seat, or reserve your private group station and share amazing virtual reality adventures with friends and family. At Univers Toutou, children can choose their new plush companion from 40-some models. They will then have the pleasure of adding the stuffing themselves and picking out different costumes and accessories. After giving their toy a name and pledging their loyalty, they get to take it home, along with its passport and suitcase! They’ll be truly “making” a friend for life! Come paint your own pottery for a unique souvenir! Children love the piggybank, while adults prefer a nice mug. After being fired in the kiln, your creation will be ready to take home. Open year-round, the Aquaclub is always a hit with families: wading pool for the little ones, main bassin with a Tarzan rope, a rock jump and refreshing waterfall. Adults can also enjoy the two hottubs (one indoors and one outdoors) and the eucalyptus steam bath. A creative experience perfect for children and teenagers! The idea is simple: you create a custom drawing of your choice that gets printed on a t-shirt, a hoodie, a hat or something else. This year again, T Bar offers a ready-made “Print and Paint” kit that lets you create your t-shirt at home or in your hotel room so you can bring home a souvenir that you can wear over and over again! 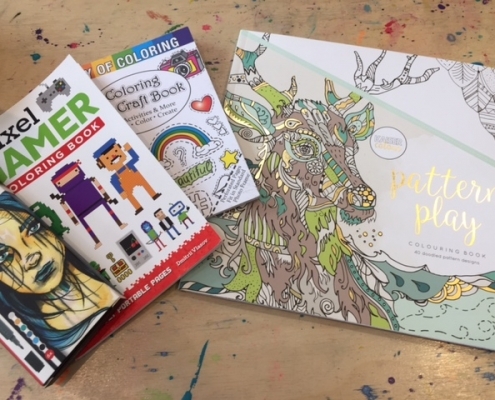 New this year, the T Bar offers adult colouring books and children will love take home one of the science or slime kits. 9. Feeling adventurous? Why not take the family dogsledding? Treat the family to a quintessential northern activity. Whether you opt to travel through the forest, over the mountain or across the valley, you are sure to remember it for years to come! Day or evening, take advantage of the beautiful skating rink on the Saint-Bernard chapel site. Borrow a pair of skates*, enjoy the music and warm your hands by the outdoor fireplace in this magical setting. * Skate loans are free for visitors staying at participating Tremblant hotels. Discover Tremblant’s Lodging Privileges. Every evening starting at 6:00 pm., come do some tubing at the foot of the mountain, right near the Fairmont Hotel. *Free for visitors staying at participating Tremblant hotels. Discover Tremblant’s Lodging Privileges. This winter, try snow biking on a Fatbike! Rent your equipment directly from the Chalet des voyageurs or the Tremblant Activities Centre (14 and older), then head out to conquer the many trails beyond the resort. For something a little different, test your skills in Mission Laser’s Elimination game. Using laser guns and your smarts, your mission is to tag the other players, one after the other! The last player standing will be crowned the ultimate champion. People of all ages love the escape games at Mission Liberté, which require strategic thinking to physically escape a given room. Your 8 to 12-year-olds will love the heroes and Jack and the Beanstalk-themed rooms. Hockey fans 12 and older will gravitate toward the Explosion room. Think you have what it takes to escape? 15. Enjoy a good meal out as a family! Here are several restaurants that offers dishes created specifically for small appetites, right in the heart of the pedestrian village! Comptoir Cuisine du Marché: Craving brunch with the family? This new restaurant offers a delicious buffet. Open daily starting at 7 a.m.
Pizzateria: A classic the whole family will love. Try the many great kids’ options, including the pepperoni and cheese pizza and the spaghetti. Casey’s Resto-Bar: At Casey’s, kids love the burger and the chicken strips. See the complete kid’s menu. Microbrasserie La Diable: For lunch or dinner, the “Little Devils” menu offers popular choices like the Minighetti, burger or hot dog, which come with fries and a drink. Chalet des voyageurs: Although it doesn’t offer a special children’s menu, kids love the chicken finger trio served here. Café Johannsen: To start the day off right, young winter sports lovers enjoy the breakfast croissant with ham. 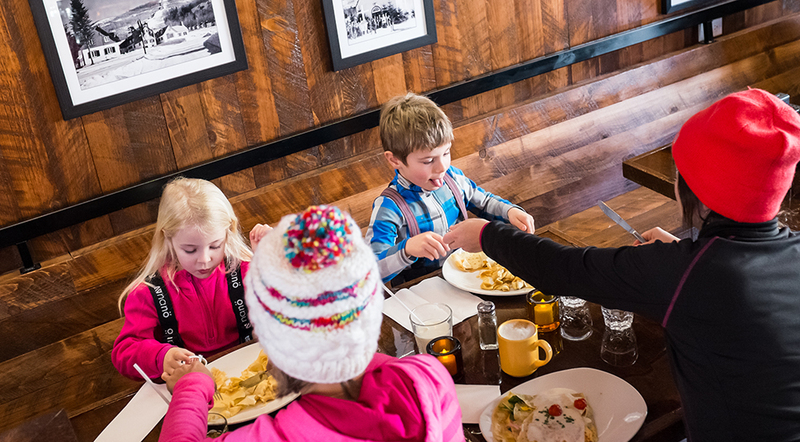 Grand Manitou: For a sweet treat, kids love the choco-banana crêpes served in the chalet at the top of the mountain. Ya’ooo Pizza Bar: For a slice on the fly, Ya’ooo Pizza Bar can’t be beat. It offers four kid-sized pizza options (mozzarella, pepperoni, all-dressed and vegetarian), served with a drink. St-Hubert Express: Great for a quick family meal, chicken lovers are sure to leave satisfied! Gypsy: Tapas for the parents and mouth-watering spaghetti and meatballs for the kids! Maison de la Crêpe: Smaller crêpe portions for your little ones, what a great idea! The tried-and-true favourites: Chococo (choco-hazelnut sauce and bananas) and Grand-maman gâteau (ice cream, chocolate whipped cream, homemade chocolate sauce and crushed SKOR candy). Mmm! SoCal Kitchen: Their kid’s menu features spaghetti bolognaise that is finger lickin’ good!